The Speakers included the OAPEC Secretary general, the chairman of the International Port Management, different analysts, researchers and consultants, the CEO of DP World Sukhna, Terminal Manager of Suez Canal Container Terminal (SCCT) in Port Said East, the CEO of Port Sydney, the Secretary General of the International Chamber of Shipping (ICS) which represents 80% of the ship owners worldwide, the former executive vice president of the Panama Canal Authority, the chief operating officer of Maersk liner business. We also attended a couple of workshops held under the umbrella of the conference where the Suez Canal Authority and the Minister of Transport discussed with the attendees different topics including the rebate system applied by the Suez Canal Authority. We also exchanged interesting views with them former Panama Canal Authority vice president and with different ship agents and lines as well as with prospective developers of the Suez Canal Zone. 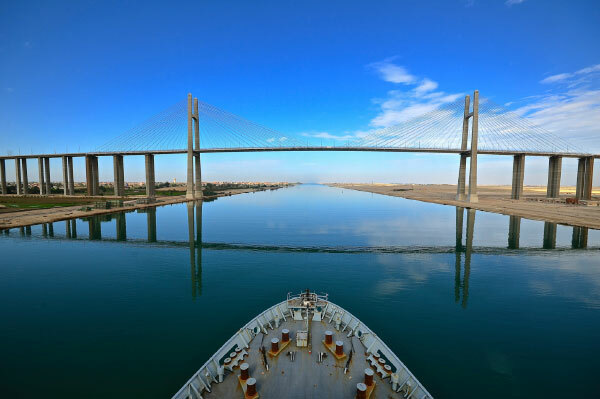 Admiral Mamish, Chairman of the Suez Canal Authority, addressed the Conference with the pleasant new of the opening of the side channel for East Port Said which will allow direct access to SCCT without having to wait for the canal convoys. The inauguration of the side channel took place on the last day of the conference February 24th 2016. A test run was completed the previous week, and the side channel was then approved for usage, with a draft of 18.5 meters. In addition to the side channel, developments are currently underway to further facilitate the access to East Port Said via 3 tunnels, 2 for automobiles and 1 for a dual railway system. Dr. Ahmed Darwish, the head of the Suez Canal Economic Zone also spoke, indicating that the Economic Zone has been approved as a tax free zone, with its own legal framework, allowing flexible and autonomous decisions in a single place. The current phase is 461 km2, encompassing 6 ports, coming out to be about 10 times the size of Jebel Ali in the U.A.E. The developments in that area have to do with transport and roads, the maritime field, in addition to energy resources. He noted that every area around the canal has its own flavor and rhythm and we must cater to these various characteristics associated with each of these ports. The attendees were optimistic that the round the clock development of the Suez Canal with its dual lane already achieved in one year, the contemporaneous inauguration of the side channel at Port Said East and the projects underway in the area will boost the Canal and will enable it to have a stronger impact on the international shipping and trade, even at the time were the crash of the oil prices would discourage the vessels to transit the Canal.